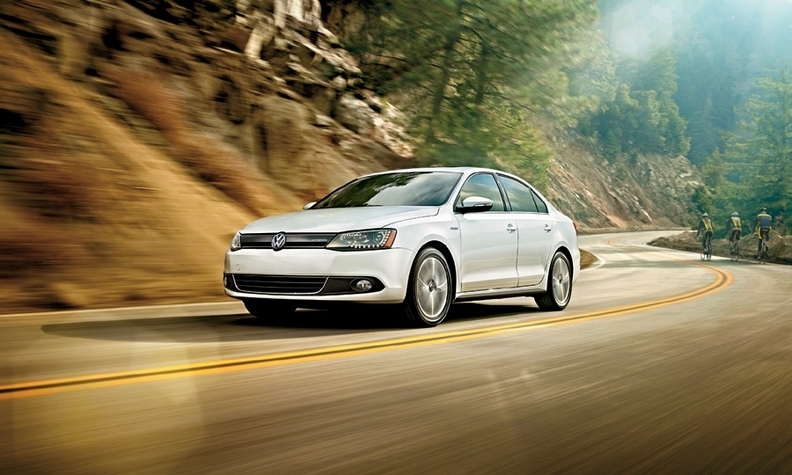 VW will use a 1.4-liter turbocharged engine in the new Jetta gasoline-electric hybrid. Volkswagen AG took the wraps off its first mass-market hybrid at the Detroit auto show with the world debut of the 2013 Jetta hybrid. The car signals a new direction for VW, which has stepped more cautiously into the battery-electric market than some competitors. VW says the new vehicle will be the world's first hybrid to use a seven-speed, dual-clutch automatic transmission. Drivers also can cruise on electric-only power for 1.3 miles (2km) and at speeds of up to 44 mph (70kph). The Jetta hybrid is the second Volkswagen hybrid after the Touareg SUV. The Jetta hybrid goes on sale in the United States in November. Pricing has not yet been announced. With the Jetta hybrid, VW aims to take on the Toyota Prius -- now in its third generation -- and other rivals in the segment. The carmaker also hopes to build on the success of the redesigned Jetta sedan. The Jetta sedan had U.S. sales of 177,360 last year, a 44 percent increase over 2010. In December, the Jetta was the 10th-best-selling car in the United States with 14,422 units sold. The Jetta hybrid will be sold at all of VW's U.S. dealerships and have much broader availability than the Touareg hybrid, which was sold by a small number of dealers. VW will use a 1.4-liter turbocharged engine in the new gasoline-electric hybrid, marking the first time the company has used this type of engine in the United States. The company also will debut its seven-speed, dual-clutch transmission stateside on the Jetta hybrid, updating the six-speed direct shift gearbox now widely available in its lineup. The hybrid's addition fits with VW's broader strategy of giving buyers a range of fuel-saving options for each model. The European carmaker has long led the U.S. market in diesel sales, but has trailed competitors in bringing battery-electric vehicles to market. That's changing. VW plans to sell a plug-in version of its popular Golf in Europe starting in the 2014 model year. The Golf EV could be sold in the United States, but VW has yet to firm up a timetable.